Okay, so after having just completed the whole anime series and seeing that, of the people who wrote reviews, nobody had seen the entire thing prior to writing them. I have decided to write this! Please be aware, this review details the nature of the various elements of the anime, it does not specifically reference any parts of the anime. I don't think describing an anime is called spoiling, or is it? If so, I apologize, please tell me how to better censor myself in the future. This is really one of those Anime that goes into extensive detail to get the audience to understand the world of Masamune Shirow. True to the other series that he has created, his limitless imagination and creation of technology surfaces once again; this time we are introduced to the concept of "The Metal". Throughout the Anime, the audience sees the roles which such futuristic pieces of technology play in the daily lives of the anime's characters. By being able to 'experience' the applications of Masamune Shirow's fictional technology through the characters, we gain better insight to the anime as a whole. The story carefully unfolds as each of the episodes draws to conclusion, the accumulated knowledge which the audience receives is key in appreciating such a masterpiece. In other words, it is really a good idea to pay attention to what is going on in the anime so you don't get lost later! I'd like to emphasize that the story unfolds with time, unlike many action-based fast-paced anime of today. People should not be quick to judge the quality of the anime based on the first episode or even the first few episodes. At first it may not appear to be following any particular storyline but as I said, it all comes with time. Unlike Ghost in the Shell, which can be called a predecessor of this anime, the environment is very vividly colored. However, all of the characters, objects, and buildings are uniquely designed. All of this gives the anime a sort-of exotic or 'new' feel. The art of the anime also presents the mood, and as such the audience is left with a less serious atmosphere than that of Ghost in the Shell. CG rendering is used sparingly and only as needed, akin to more 'traditional' animation. It feels as if more work is put into doing animation than CG nowadays. I guess, I'm a fan of crisper and detailed images, but the slight blurriness of the background allows the audience to not be overloaded with images. I am referencing Ghost in the Shell because it is the only other Masamune Shirow work that I have seen. There are also some almost psychedelic colors and patterns, in "the Metal" to contrast the bright, paradise-like environment of the Real Drive world. Perhaps one unique quality, in this anime, which can be noticed immediately are the characters. The characters are generally a bit on the chubbier side, which is fine, considering, in reality, how many people are actually as thin as characters portrayed in many anime. This contributes to the believability of the anime as a whole. After all, not all anime have to conform to the typical, aesthetic pleasing, character design in order to be considered good. Perhaps it can be said that the characters behave true to their appearances, e.g. behavior. Each of the main characters undergo varying levels of development and thus each character is unique and brings forth their own contributions to the story. At first glance, the music in this anime is quite different from the OP/ED themes. In fact, they appear contradictory of each other. The OP/ED are kind of like hard rock while the BGM fits smoothly and refreshingly into the art and with the characters of the anime. Much of the upbeat music in the anime had been synthesized with a computer, perhaps has to do with the fact of being futuristic. However, some less upbeat tracks are simple and use few instruments such as the piano, glockenspiel, violin. All of these tracks suit the changing moods in the anime. Getting back to the OP/ED themes, though they contrast the BGM, I don't believe they are bad decisions. They aren't bad to listen to either and hey, if you're bored they're a good wake-me-up, ha ha ha. One thing about the OP/ED of this anime is that they are shorter than the usual OP/ED, instead of being around 1:30, they're only around 1:15. This makes for less interruption I suppose, I definitely did not mind them being shorter. They also make each episode a smaller filesize and such benefits people with less storage. The journey from the beginning to the end of the anime was well paced and advanced accordingly. There wasn't ever a feeling that there was no story left or too much story at the end. Perhaps though, being a more evenly-paced anime would cause some viewers to get bored really fast. Even more-so when not even all the subs were out. Having fine details yet needing to wait for weeks until the next episode, definitely does not help to tie the anime together as a whole. I suppose it is more suitable to watch it all the way through over a shorter period of time. All of the music is crisp and cleanly composed and fits well the changing environment and moods of the anime. You can listen to the OST on its own and it would still sound good, preferably on 5.1 surround sound please! The characters are uniquely designed and should be accepted for that fact; it should not deter the audience's perception of the character as an individual . As well, as individuals and groups, undergo substantial development and growth throughout the anime. This makes them seem more believable, real even. Each of the individual elements (such as the ones above) of this anime were tied together well, everything was place somewhere for a reason. As with many others, this anime started off a little on bland in my mind though, slowly but surely, I began to appreciate all of its fine details. True uniqueness is very difficult to accomplish when dozens of anime are broadcast throughout japan every season but, I will remember this as something truly different from the rest. Edit: After reconsideration, I have lowered Character to 9 because not all of them really, noticeably, develop over time. Real Drive is a sci-fi series that deals with the impacts of the dependence on the Internet(the Meta Real Network, in the setting) on society, other than focusing on the effects on single individuals. Set in 2061, it seems to expect a slower evolution of human technology then we see on other similar works. The story mostly occurs on an artificial island that is itself built as the pinnacle of the present technology, but most of it's design and features are not something one would be surprised to find on an high-tech experimental facility today. The plot starts very slowly, with single episodes depicting the life of the protagonists on the island and interesting events that occur to them mostly on their jobs, as all are somehow connected to a role of maintaining and developing the island. 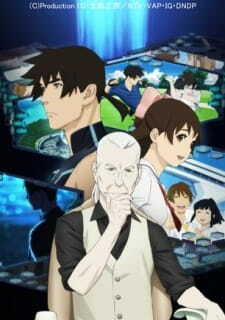 As the series progresses, comparisons between the Metal and the ocean become more numerous and relevant, and the story starts revolving around the environmental impacts of the island as it reaches it's final stage of completion, and on the development of the main characters, as well as a small focus on the philosophy of human-like AIs. The art is simply astounding, the feeling of connection with nature, specially the sea, is a primary concern, which translates into simple designs for buildings and virtual interfaces (as opposed to heavy designs cluttered with pseudo-scientific artifacts as is common in sci-fi), and an amazingly consistent color palette. For example, it's quite rare to find a frame without a single blue hued pixel in it. Another notable part of the art is the &quot;chubby&quot; character design, specially for females, very uncommon in anime, it is most likely linked to the author's view on the future of the ideal female body, as a consequence of the current fattening tendency of the human populace. The background music is rare, and in most scenes it's present it's hardly noticeable, which, however, fits the mood of the show. The intro and outro songs, on the other hand, are very aggressive and enticing, specially when coupled with their respective video clips. The voice acting is very good, with special merit to the gynoid character Holon and lookalikes, which contributes the most to the believability of the technological setting, along with the audio filter used for voice communications done within the Metal, that at the same time does not hinder the comprehension of the voices and is very easily identifiable by the spectator. Finally, the characters are very well designed, each has it's own clearly defined goals which they are constantly developing towards, through either physical or mental training, self-prompted personality changes or even built up life experiences that give birth to epiphanies. Overall, Real Drive is a refreshing take on the genre, approaching even present day situations with characters' struggles and themes such as environment protection. The slow start, however, hinders some of it's true potential and blows away some viewers, myself included, but the show shines at full force towards it's climaxing end, and, while not really present plot-wise, all previews episodes are part of the build up that leads to it. Real Drive is tough to write a review for. As promising as this series is, it has a major downfall: it can't find its balance. The 1st and 2nd episodes are a great start, giving you all of this information and an interesting and slightly mysterious lead in Haru. I found myself immediately wanting to know more about the Artificial Island these characters inhabit, and, most of all, about what exactly happened 50 years ago to Haru. While the main character may be Haru, this series really switches the focus up after the 4th ep. After that, it becomes Minamo's show until a little past the half way mark, becoming a really drab slice of life with the story left on the back burner. Once it hits that later part of the series, though, it ramps up and you start to get a story again. It's a real shame that the entire series isn't like that, because those last few episodes were really fantastic. The first thing you notice about this series is how crisp the colors are. The animations for the ocean are particularly beautiful, as they should be when the sea is the focus of this series. The near future setting allows this series to retain a sort of familiarity while being entirely alien at the same time. Many people complain that most of the characters look fat, but by the time you finish this, not only will you not notice it, you probably won't care. The characters themselves are animated well, but its nothing really special. The underwater facility is absolutely gorgeous to look at, like the majority of the background, and you'll probably be paying more attention to them than the characters. The Metal, while an interesting concept, often looks light years behind the rest of the animation standard, with a lot of its CGI looking clunky in comparison. The music is give or take. Some of the more orchestral stuff sounds like it could have come from a Hollywood movie, while other things sound about as boring as elevator music. The OP is decent, but the ED is annoying, and I ended up skipping it every time just to get it over with. The sound effects are spot on, and the V/Os are solid. The other supporting characters often had good foils, even if you learn little to nothing about anyone's past except for Minamo and Haru. Since the show focuses more on Minamo than anyone else, when you do get an episode or two that stars someone else, it's a real relief. All of the characters do their jobs perfectly, but none of them are very memorable. I went into this mainly because I love Shirow, and came out with mixed feelings. Its an interesting series, and some of the things it brings up deserve discussion, but there was just too much filler to make this great. RD is a sci fi/cyberpunk anime that is highly reminiscent of Ghost in the shell. It also sends out the same message in regards to a person's humanity (what is it that makes us human?) and the overall effects of humanity on the world around us. Real Drive is probably one of the more &quot;ethical&quot; animes that I have seen recently. The show comes with a variety of characters, including androids and &quot;cyber-brained&quot; people. So, unless it's watched from very early on, you can easily confuse between the two. I doubt that this is the sort of anime that you can start watching in later episodes. It's set, for the most part, in the future - mankind has harnessed the power of robotics (hence the afore mentioned androids and cyber-brained individuals). Here, there exists &quot;The Metal or Metal Real&quot; - something that you could consider the future of the internet. Where, individuals can immerse themselves in a world of fantasy, but even that comes with it's own dangers. Real Drive is set in 2061 AD, but the anime starts out 50 years before this during the construction of an artificial island that will eventually be where the anime is focused on (you spend very little time in the past, but it's pretty much central to the anime). It also focuses a lot on the work of Masamichi Haru and Kushima Eiichirou, who are the central characters in this series. I have to admit that the series ended a little too abruptly for me - almost like everything was mashed together into the last 3 - 4 episodes. That said, it all works together quite well. However, it still left me wanting more.